Paint a large red circle on the card. Just inside this paint an orange circle, then a yellow circle, and so on until you reach violet. When the paint is dry, cut around the outside of the red circle and remove the middle of the violet circle to make a doughnut shape. 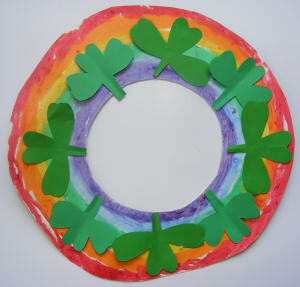 Cut out lots of shamrocks from the green paper, then glue them around your circle and then hang your wreath. Rainbow guiders: Why not make a larger version, using the girls' handprints, or self-portraits, instead of shamrocks? You could even laminate cut-outs of the girls' handprints or photos or names, stick hook and eye fasteners to the back and the wreath, and have the girls stick them on every session to help keep a register.